It is renewal time again. Please detach the membership renewal form and return with your payment or complete online and pay using PayPal. Renewal options are 1 year $20.00, 3 years $60.00 or life membership $400.00. Support your Association; order your Averages & History Yearbook at the same time for only $10.00 (one year) or $30.00 (3 years). Please note the addition of postage, $4.00, for yearbooks ordered after 1/1/2014 – save postage and order early. Your 2014 membership card will be mailed to you once all scores are recorded – mid to late November. Thank you to those that supported our young shooters’ memberships in 2013. We continue to offer this option as your way to SUPPORT THE FUTURE OF THE SPORT with one small change. Your donation will be used for memberships as well as other youth related expenses. Sponsor one or more new youth shooters. We hope all clubs will participate in the Y-E-S training program and send their teams to the 2014 Grand Pacific competition. Over $8,000 in scholarship money is awarded annually to teams at State/Provincial shoots and the Grand Pacific. Have you visited the P.I.T.A. website recently? Make plans to attend the 2014 P.I.T.A. 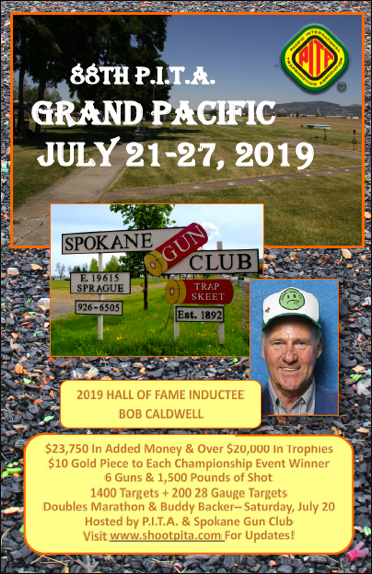 Grand Pacific – July 20-24 at Evergreen Sportsmen’s Club. RV reservations are being accepted. Phone or email for rates and more information. The Executive Committee will finalize the program at their winter meeting. As always, your suggestions are welcome. In an effort to reduce expenses and save some postage we are offering a new way to pay your PITA membership and order your 2013 Yearbook. Print the renewal form and mail it with your check or save yourself some postage and pay online using PayPal. If you would like to pay with your credit card you can do this as well by calling the PITA office at 541-258-8766. You can also pay at any of the shoots you attend. The P.I.T.A. target year is from November 1 through October 31. Once all shoot reports/scores have been received and averages are calculated membership cards are mailed. This usually occurs in mid to late November depending of course on when reports are received from the clubs. Cards are mailed at one time to take advantage of presort mailing rates offered by the Post Office. Renewal reminders are printed and mailed in early December.